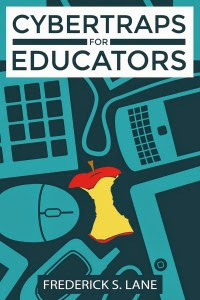 Cybertraps for Educators by Frederick S.Lane is a must read for all educators who want to know more about the dangers of the use of modern technology. The internet is a large part of our lifestyle nowadays. We use it in both our work and home for many different purposes and should be well aware of the traps and perils of it’s usage. The twenty three chapters in the book comprises of case studies and problems that educators faced during their career relating to the use of the internet inside and outside the workplace. Cyberloafing, Cyberporn, cyberstalking, cyberbullying and sexting are topics that are covered in detail. All these have serious repercussions for the individuals who are involved in these illegal activities. An educators career is at stake if he/she is caught guilty or implicated in of any of the crimes mentioned above. It is one thing to be social and another thing to have your live out your life under the microscope being a “celebrity” due to the wrong reasons. Once you fall into such a trap it is certainly very hard to escape from it. Technology and it’s accessibility can be a double edge sword for educators. It can be use for as a means to source for additional teaching material. It can enhance the learning experience for the students through the use of various online programs or apps. It is used for stimulating interaction between students and enhancing their ability to understand certain concepts that were being taught. All these are good and beneficial however there is a fine line between using it for good and being harmed by it’s usage. Educators need to know where that LINE is and the need to keep certain information private and away from the prying eyes of colleagues and students. Whatever we put out in the WWW has to be seriously scrutinized before we press the button publish. I found this book a thought provoking read and it really shows the dark side to using online social media and having a public online profile as an educator. If you are interested in reading in detail about the various Cybertraps do grab a copy of Cybertraps for Educators from Amazon. I can see where this would be a helpful book, and thinking before you publish is wise advice for us all! Linking up behind you at Mama Kat’s. wow, more to keep teachers on the straight and narrow. You have to be Ceasar’s wife to avoid problems as a teacher. It builds character and diminishes you at the same time. I think I will check the book out. I had never heard of cyberloafing before. Take care. Great post. Definitely a book worth looking into. As an educator, I almost find books like this frustrating because I see everyone – particularly students – getting caught up in these issues. When I’ve taught digital literacy, I’m always amazed at what I see students & adults making the same glaring errors. It’s almost as if we all need reminders each time we get online. Interesting! I’m always a little surprised when I see friends of mine who are teachers or in educational positions that allow their students to be connect with them online. I think sometimes people forget that on outlets like FB, you don’t have control over what OTHER people post about you…you may not put up that photo from a crazy evening out, but your friends could. It’s definitely a tricky world to navigate with little ones. That sounds like a great book! Interesting. I never thought of these things. My mommy-blogger friend asked me to get a copy so we can be diligent daw in using gadgets, but, I wasn’t able to get it.. After reading this post, I am convinced to get one soon. Thanks for sharing. This sounds like a great book for educators and parents. The Internet has opened the door to new crimes and it is important to understand these things so that the kids can be educated. Children nowadays have access to almost everything with Internet. The good and the bad are readily available. We need to be vigilant and discern which content will harm them. This book looks like it provides great insight for parents and teachers alike. This book is very valuable for all people, who are using internet now a days. Thank you for sharing this kind of important information through your post, keep sharing. thank you so much for this informative information. As a teacher this is very important to know! Sounds like a very thought provoking book. People , educators or not, should read this once and for all. Interesting indeed. Very interesting! We really need to be careful what we post on the web. And we need to watch what our children are browsing when they use the internet. This sounds like a very informative book. Technology, internet have ups and downs, good and bad effects to all of us users. A very informative book, i think. Technology, internet have ups and downs, good and bad effects to all of us users. hmm interesting. We do have to be very cautious considering we are raising our kids in internet era. Thank you for sharing this!